Stellar of the Seas cruises welcomes you to experience the new definition of contemporary luxury. 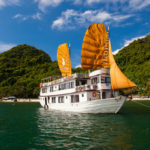 We offer not only a luxury cruise service of the highest safety standard but also a completely unique experience with a carefully researched itinerary, attentive service, authentic decor, delicious food… That makes your vacation be a truly unique and unforgettable experience. The cruise contains twenty-one elegant spacious rooms, full of finest comforts such as fine dining, the panoramic bar, wine and cigars cellar, golf club, seasonal swimming pool, beauty spa & massage, children playground… Our personalized service, tailored to your needs, is what sets us apart and makes your visit to Halong Bay unique and memorable. Board the Stellar of the Seas cruise where a mesmerizing experience is guaranteed. 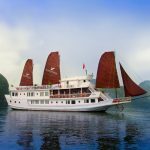 Day One: Hanoi – Tuan Chau marina – Halong bay – Lunch – Swimming at Ba Trai Dao natural beach area (in Lan Ha Bay) – Sunset party – BBQ Dinner – Onboard night activities. – Arriving Tuan Chau marina. Welcome aboard the cruise. Refresh with our welcome drink. Meet the captain, crew in the cruise briefing, safety instruction. – Join us for a typical lunch in the luxury dining room with indoor or outdoor dining area. 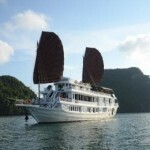 – Continue cruising through Con Vit islet, Thumb islet and Gia Luan habour where belonged to Cat Ba area. 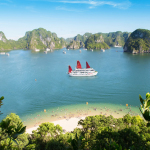 – Discover Ba Trai Dao natural beach area belonged to Lan Ha bay. Drop anchor for swimming or kayaking or just simply sunbathe on the natural secluded beaches (private, wild and fresh air). – BBQ dinner is served with fresh food menu outside of swimming pool area. – After dinner, reward yourself with a large selection of cocktails at panoramic bar with seasonal pool view, at wine and cigars cellar, or take one of our onboard activities: games, movies, and squid fishing… or relaxing with massage services. – Return to the shore and disembark from the cruise as our crew say farewell. – Transfer to ultra-luxurious limousine returned to Hanoi. Visiting Tung Gau grotto by kayaking or swimming, passed by Tay Keo islet. – Back to Stellar of the seas, take time to refresh or play some short game in our golf course or relax with massage services as we cruise to sleeping area. BBQ dinner (different menu) is served. – After dinner reward yourself with a large selection of cocktails at our bar, swimming pool, wine and cigars cellar or enjoy the landscape of the bay at night. Relax with massage services. Take one of our on board activities like squid fishing, watching a movies in the restaurant.